In keeping with the theme from last week’s post, we decided to explore yet another unlikely hero in the carpet world. This one doesn’t welcome the feet of Greek gods or today’s celebrities (well it might, depending on what narcotics they’re ingesting), but instead welcomes the feet of some of fiction and myth’s favorite characters. We’re speaking of course, of the magic carpet. 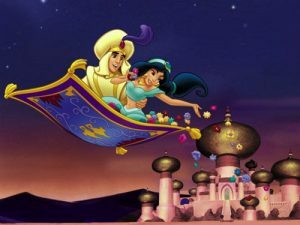 The magic carpet is probably most memorable from the Walt Disney classic movie, Aladdin. Aladdin ventures into a mysterious cave with the incentive of a magic lamp that allows three wishes to its owner. Who would say no to such a thing, right? Well, Aladdin should think these things through more carefully as this ‘Cave of Wonders’ turns out to be more trouble than it’s probably worth. Not to be killjoys and give away the end of the movie, but never fear- Aladdin not only ends up alright, but surrounded by the best of friends and a beautiful girl. Plot summary over. One of these such friends is the magic carpet, the hero of our Knox Carpets story today. But the magic carpet’s presence actually began far before the creative minds of Walt Disney Studios were around. It first made its appearance in One Thousand and One Nights, the story of Prince Hussain, who travels to India and buys a magic carpet. This magic carpet allows him to immediately transport from one location to another. It was reportedly made of green silk with a golden weft, sixty miles long and sixty miles wide. Now if you ask us, that sounds like a whole air hangar, much too much room for just one person. We hope that he was as hospitable as the team at Knox Carpets. And we can’t forget about our American friends. It started with Mark Twain’s “Captain Stormfield’s Visit to Heaven,” where the characters use magic wishing carpets in order to travel to and around the realm of heaven. If you fast forward to the 1950s, many a musical star sang about magic carpets and the crazy places that said magic carpets took them to. These are the magic carpets that we must assume are the more hallucinogenic-supported. While the carpets and flooring solutions at Knox Carpets probably won’t lift you off of the ground, transport you around heaven or enable you to simultaneously teleport from one location to another, we have to say that they’re probably our favorites out of the bunch. After all, their magic powers include ensuring lasting memories with your family and friends, as well as doing their best to remain clean and beautiful under all sorts of pressure. And that’s why we decree every carpet in our inventory, a magic carpet.